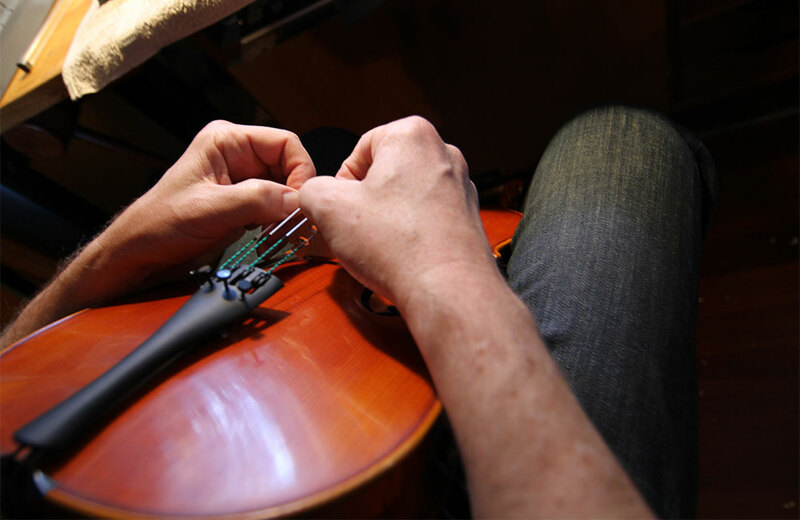 In time, as violins, violas and cellos are used, tuning the strings on the instrument eventually cause the bridge to become slightly angled, leaning upwards towards the top of the instrument and the fingerboard. It can affect the sound of the instrument, warp over time, and may eventually break. This happens to almost all violins, violas and cellos as they are used, and it is the player’s responsibility to learn how to maintain their bridge by straightening it. Between once a week and once a month, depending on the frequency of tuning, the instrumentalist should check their bridge for proper positioning. A poorly-attended bridge can be ruined, turning crooked, in as short a time as several months. A well-attended bridge can last for decades. The first step is to place the violin (or other instrument) on a cloth so that it doesn’t get scratches or other damage in the process. Next, the musician places two fingers of one hand against the fingerboard at the strings, then two fingers from the other hand against the tail piece at the strings, fingers pointing. The thumbs are then used for gradually moving the bridge. Slowly and carefully, the bridge is adjusted to stand in the most upright position. The bridge should be at a right angle with the violin face on the tailpiece-side. An object with a 90-degree angle such as a business card can be placed to check for a perfect angle. The front of the bridge toward the fingerboard should be at a slightly obtuse angle going toward the tailpiece. If a bridge is permanently bent, it can possibly be straightened. First it will need to be softened with warm steam. The bridge is placed on a clean metal screen over boiling water to absorb the steam. Next, the bridge is clamped between two blocks of wood, or put under several heavy books, until it dries over the course of a day or two. If a bridge on a violin, cello or viola breaks or is damaged, it is best to take the instrument in to an experienced luthier or violinmaker at a local violin shop.